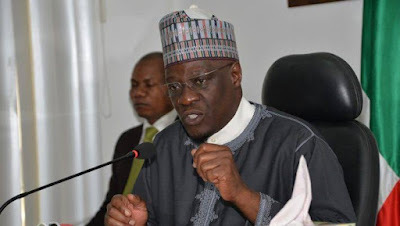 One Issa Jamiu Jimba, a former Peoples Democratic Party (PDP) member was said to have been sacked by the Kwara State government for leaving PDP for APC. I was a bona fide member of the people's Democratic party since 2003 till 2019. Just about a week ago , I left the Saraki dynasty and today my appointment got terminated . Despite that I got the appointment unpolitical. I have worked exceptionally large for saraki throughout my stay in the course . I stayed for good 15 years of hardship In the dynasty and I also stayed unemployed throughout the course . Then , I realise saraki left APC for PDP for personal interest and I uplifted my mind and left the dynasty for another party since they care less about our daily and personal affair in the Saraki dynasty. Just a week after, i went to collect the 10,000 monthly salary as usual but to my surprise my name was crossed , why because I am no longer a member of PDP. It was then i realised how uncertain and gullible the Saraki dynasty can be . For proper identification, I am Issa Jamiu Jimba From Ilorin West Local Government, Magaji Ngeri ward , Jimba -Itakure zone. We doesn't value the lives of our youths and elderly ones rather they desire stipends and appreciate monetary policy than protecting the future of our youths . During Peace corps, free forms were dashed out to citizens of Nigeria ,in my constituency two forms were dashed out to us but our zonal chairman sold it to One "Aremu Ebenezer" of which he is not even a member of my community , not even knowing peace corps will not see the light of the day. During kwayep recruitment, more than 10 kwayep was installed to our community but to our surprise more than 5 was dashed out to some community leaders girlfriends. After that I went out to find a means of livelihood and i found a helper who offered me the application of kwayep. Empowerment: About two months ago , several empowerment was installed to our community but the same zonal chairman held one to himself , one to his mum and one to his daughter. Please have I done anything wrong by leaving such a deadly forum ? Up till this moment I am yet to understand the reason behind this compelling act, maybe but I believe the state government should please stop embarrassing us. And they should employ the brilliant youths who can help in fostering the affair of its people and enable the peace loving ideas in promoting the real image of our dear state . Harmonious , Kwara it's good here indeed .